A new Stanford study released on Wednesday says hot and dry conditions are increasingly going to hit multiple regions at the same time — shrinking crop yields, destabilizing food prices and laying the groundwork for large wildfires like we've seen in California in recent years. This comes on the heels of another study earlier this week from the American Geophysical Union which measured the rise in extreme heat events in both summer and winter. The AGU study was one of the first to also look at relative extreme temperatures — "hot" days in winter, cold days in summer. The news, across the board, isn't great. The Stanford study examined historical data to quantify the odds that different regions experience hot and dry conditions in the same year. The authors calculated that before 1980 there was just a 5 percent likelihood that two separate regions would be dry and have extreme temperatures in the same year. Since then, the odds have risen to 20 percent. This matters because in the past if one region was hot and dry, resulting in low crop yields, the agricultural surplus in another region might compensate. Increasingly, that's no longer the case. For example, the odds that both China and India — two of the world's largest agricultural producers — have low precipitation and extremely warm temperatures in the same year has increased from 5 percent to 15 percent. “When these extremes occur simultaneously, it exacerbates the adverse impacts beyond what any of them would have caused separately,” said Ali Sarhadi, the study’s lead author and a post-doctoral fellow at Stanford. The study also analyzed climate projections for future scenarios. Since the late 19th century, the global temperature has increased 1.8 degrees Fahrenheit. Moving forward, the study's authors found, in many regions the odds increase to 75 percent that average temperatures will rise well beyond the normal range experienced this last century. It's not just going to get hotter in the summer, though. It's going to get warmer in the winter too — which also has lasting implications. 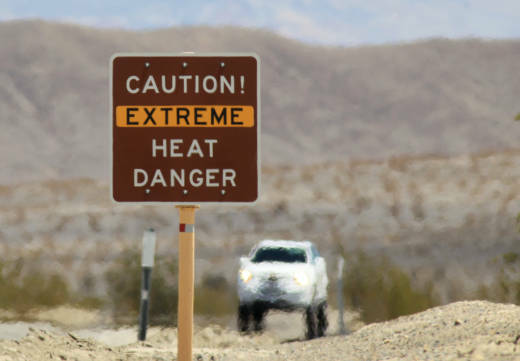 The other new study released this week, from the American Geophysical Union, found both relative and absolute "extreme heat" events have increased across the U.S. and Canada since 1980, while both relative and absolute extreme cold events decreased. In other words, we've seen a rise in both overall extremes, like the absolute hottest days in summer, but also extremes for the normal range of that time of year, like unseasonably warm days in winter. Relative extremes are changing faster than absolute extremes. And relative extremes can pose a higher ecological risk because the out-of-season weather impact species and plants. “Relative temperature anomalies can trigger what are called phenological mismatches, where a mismatch in the temperature and the season can cause trees to bloom too early and birds and insects to migrate before there is appropriate food,” said Scott Sheridan, professor in geography at Kent State University and lead author of the AGU study. For example, the unusually warm month of March in 2012, across the eastern and midwestern U.S., caused vegetation to bloom prematurely and then die off in subsequent frost, leading to large agricultural losses (2012 remains the hottest year on record in the continental U.S.). Mid-winter thaws and early-season heat can also have health impacts on vulnerable populations. Extreme heat events have increased across 79 percent of the U.S. and Canada, with the trend greatest in the southern U.S. and northern Quebec. Relative extreme heat events have increased at a greater rate, averaging .22 more days per decade, with some parts of the southern U.S. showing an increase of up to one day per decade of relative extreme heat. At the same time, extreme cold events have decreased at higher rates. All of this comes in the wake of a federal report released last week that outlined the ways climate change is already affecting Americans' economic and physical health. The message from the various studies' authors? Planners and policymakers at all levels need to start preparing for the new future -- and can still take steps to decrease these impacts. The Stanford study modeled what would happen if the 200 nations in the U.N. Paris agreement achieved their emission reductions targets. The authors found that would dramatically reduce the likelihood of compounding hot, dry conditions in multiple regions. “There are still options for mitigating these changes,” said Sarhadi.